The spacesuits used during Apollo were only rated for 2-3 days of use before they wore out. Suits used on the International Space Station are being used long after their designed lifespan, simply because there are no alternatives. We cannot send crews to Mars on 500-day surface expeditions with suits that only last a few days. The US Office of Inspector General has issued a report criticizing NASA for running the ISS suits well past expiration while spending over $200 million on new suit technology that still hasn't produced a single operational spacesuit, and cannot for another six years at least. This issue not only threatens future operations beyond the ISS, but threatens operations at ISS itself if the suits fail before they can be replaced. SpaceX is planning to be ready to land humans on Mars by 2024, but NASA won't even have a prototype suit that works with ISS until 2023. Unless SpaceX is building not just an internal or EVA suit, but a full surface suit, in house, a crewed mission will not be viable. NASA has over-analyzed the problem to death, and their research is largely public. There is a good chance SpaceX and Blue Origin can develop suits in house or with cooperation from NASA, but no evidence they actually are doing so at this time. NASA itself needs to make this a priority before it becomes even more of an embarrassment than it already is. It's bad enough they can't launch people into space after the shuttle. Think how bad it will be if they can't even go outside the spacecraft. That's not much of an astronaut corps at that point. The spacesuits currently in use on the International Space Station (ISS) were designed in 1974 and first used in the Space Shuttle in 1981. They were designed for a 15-year lifespan, but have dramatically exceeded that limit. In addition to this, the interval between major ground maintenance has been extended from six months in 1995 to six years in 2008. Eighteen Extravehicular Mobility Units (EMU) suits were originally constructed. Of these, two were lost each in the Challenger and Columbia disasters. One was lost in the cargo Dragon flight failure (SpaceX-7), where it was being returned to the space station after refurbishment. Another early suit was destroyed in ground testing. Three are used only for ground testing and certification. Two were dismantled due to water contamination issues. Four are currently onboard ISS. Three others are either refurbished or are being refurbished. ISS requires a minimum of two suits per EVA. There have been 27 significant incidents of EMU problems in the 204 spacewalks that have been completed so far. The half-trillion dollar ISS is expected to be in operation through the year 2024. There are 17 EVAs planned between the time of the Office of Inspector General report (April, 2017) and March, 2020. If any external, mission-critical system, such as a coolant pump, fails or requires maintenance, there will be additional spacewalks required to repair that system. Further, if the spacesuits themselves have a problem, they may be “grounded” until the cause is found and corrected. This situation already happened (external failure and spacesuits unavailable due to failure investigation) in 2013. The EMU also have a number of design flaws, which have caused issued with water getting loose in the suit and presenting a danger to the astronaut and onboard electronics. Even if the EMU suits were in perfect condition, they are only useful in microgravity. The legs are only able to move enough to allow a crew member to lock into footholds on the station. They do not have enough flexibility to allow one to walk on the moon or Mars. To make things worse, there have been three development programs at NASA for advanced space suits. These have cost over $200 million to date, and one is only for onboard use in an emergency. 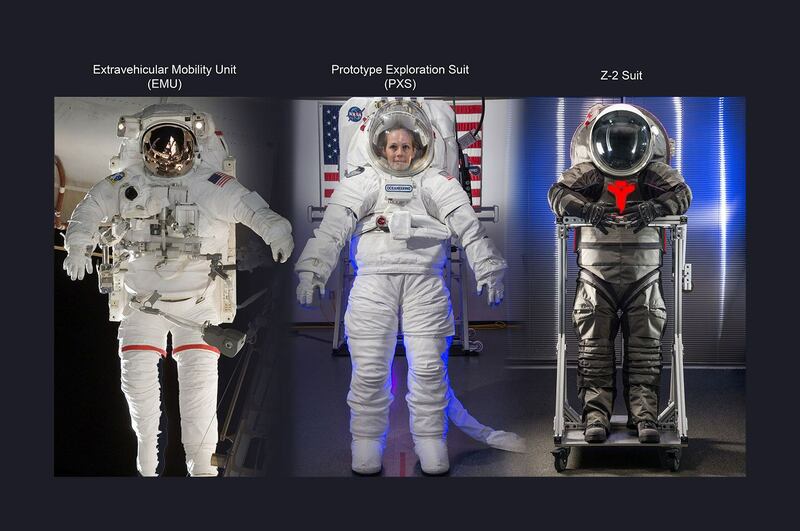 None of these suits are anywhere near being ready for use, either at ISS or in deep space. They have been in development since 2007, or ten years, at the time of the report. So far, only one prototype Z2 suit has been delivered to NASA for testing. NASA has changed direction to focus on bringing a replacement ISS suit called xEMU Lite for use on the ISS into production. They would then move onto new versions for deep space and surface use on the Moon and Mars. The ISS version would use a hard torso, advanced life support, and a number of other improvements. The plan is to have something purchased in 2019 for use on the ISS in 2023, a year before it is planned to be dropped into the Pacific Ocean. Like the Russian suits, it also allows the crew member to climb in from a backpack hatch rather than put the suit on in pieces like conventional clothing. This system is much more practical in space, particularly on the Moon and Mars, where there is a high priority to keep dust outside the crew cabin. That said, NASA is not spending enough money or effort to get this system launched before ISS is no longer a destination. Efforts seem a bit feckless at the moment, like a high school lab project with a budget but no goal. Dava Newman spoke at the Mars Society Conference and discussed NASA’s projects with spacesuits in part. She is working on these spacesuits, and has made some impressive strides in ergonomics and comfort. They have had 26 shoulder surgeries on astronauts for training injuries to date. Astronauts do ten hours of practice in a neutral buoyancy tank for every hour on an actual space EVA, using a water analog to the spacesuit. Therefore, these efforts are actually important to future work. That said, why wouldn’t these issues have been resolved decades ago? Even knights in armor wore quilted liners under the armor to avoid pressure point injuries like the ones she is resolving at MIT. NASA has quite a few small plans that are beneficial to future exploration, but they are a bit isolated and unfocused compared to Apollo efforts. ​Both SpaceX and Boeing have released photos of their suits for use on their privately-developed ascent capsules. The purpose of these suits is to ensure crew survival within the spacecraft in the vehicle develops an air leak. These suits are entirely unsuited to use outside a spacecraft – they have no thermal regulatory systems for sun and shade, and no protection from space debris or radiation. SpaceX wants to launch BFR rockets to Mars in 2022- cargo at first, then crewed in 2024. SpaceX is already well along in developing non-flight systems for this mission, including the propellant production plant for making oxygen and methane to refuel the spacecraft on the surface for the return flight. NASA’s efforts in this area will happen in 2020, when a tiny experiment will make a tiny amount of oxygen on the next large Mars rover. 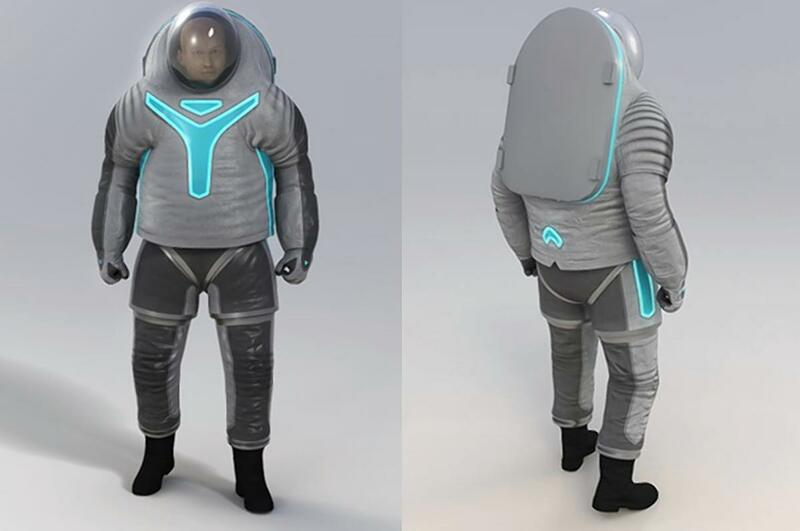 NASA won’t have a suit even close to this capacity in 2023, though the key life support components should be ready by then. Does this mean that SpaceX is also far along on a private surface spacesuit, well beyond the capacity of the $200 million, decade long NASA effort? They already have a suit built in house for onboard use, meaning they have the basic capacity that NASA had in the Gemini era a few years before Apollo. On the other hand, SpaceX has a tendency to focus on one or two key things at a time, while delaying non-mission critical projects like Falcon Heavy for years while getting financially-necessary systems in shape. Companies that do not survive in the short term do not need long term plans, and SpaceX knows this. BFR for suborbital and orbital use, along with Crewed Dragon, will consume the company engineering resources for the next few years almost entirely. ​It’s also not just Space-X. Consider that Blue Origin’s follow-on to New Glenn is Blue Moon (a lunar lander) and New Armstrong (a lunar-capable heavy lift rocket). While not directly on the critical path, I would assume at least some effort is being made somewhere at Blue Origin on this topic. When Elon Musk announced, via Twitter, that he was planning to send two tourists past the moon in a Dragon capsule in a few years, he made it clear he doesn’t plan to wait in line behind NASA forever. This ruffled some feathers at NASA, where staff was OK with commercial space working in orbit, as long as NASA kept the rest of the solar system as their workspace. Having private companies do operations much more quickly, and more efficiently, than the “professionals” at NASA or other space agencies is quite embarrassing.